I love coming back home we always discover something new fun and fresh. Last year it was the Eat Street Markets this year it was The Obliteration Room... I just had to share.. 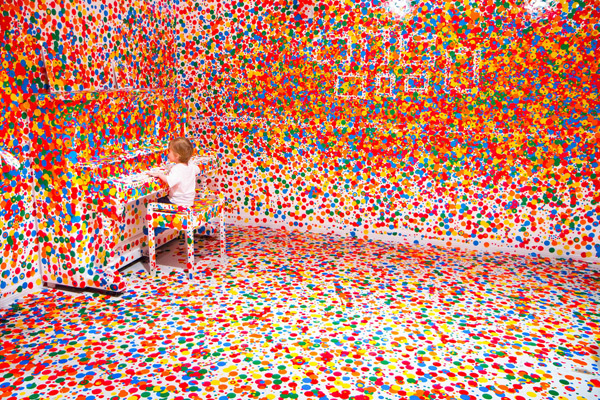 Located in Brisbane's GOMA (Gallery of Modern Art) is Yayoi Kusama's art installation. It's a simple concept really - of taking a completely domestic environment which in fact is a dining lounge and kitchen complete with everything you would expect, painting it white then as the word suggests and this is the public's duty destroying it with coloured dot stickers. The end result resembling an explosion of colour. The exhibition is definitely a winner with kids but is nothing short of awesome for adults too and whilst the simple act of dotting 30 stickers is the sole purpose most people find themselves lingering a little longer just staring in awe or discovering lots of quirky household items, pretending to live in the space. Selfies and cameras are a must.